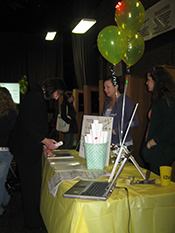 Thanks to everyone who helped to make the UofL CE Showcase 2010 a huge success! Ideas to Action in conjunction with the Office of the Vice President for Community Engagement and the Office of Civic Engagement, Leadership and Service have organized the 2010 Community Engagement Showcase. At this showcase faculty, staff, and students will share with the University community how they are applying teaching/ learning, research, and service to address community needs. Posters, informational displays, and interactive presentations will highlight community engagement activities related to a course or activity. There are three categories for the showcase: General Community Engagement, Community Engagement and Ideas to Action Culminating Undergraduate Experiences, and Community Service. This category includes community engagement activities in which students are engaged in the community as part of a course requirement. This includes, field placement, practicum, service-learning or other forms of community-based learning courses. This category includes community engagement activities in which curricular projects demonstrate well-cultivated critical thinking skills that reflect the Paul Elder framework coupled with purposeful community engagement through senior-level Culminating Undergraduate Experiences. This category includes community engagement activities that are not associated with a course. Any community service through student organizations or University units in which students are involved are eligible to be presented if the following areas are addressed thoroughly.